Dutch soccer great Johan Cruyff, who revolutionized the game with the concept of "Total Football," has died. He was 68. Johan Cruyff, seen here taking in a match in 2009, was a three-time European player of the year and a key member of the Netherlands' storied 1974 national team. Family spokeswoman Carole Thate confirmed to The Associated Press that Cruyff had died. Joaquin Munoz of the Cruyff Foundation in Barcelona said he died as a result of lung cancer. 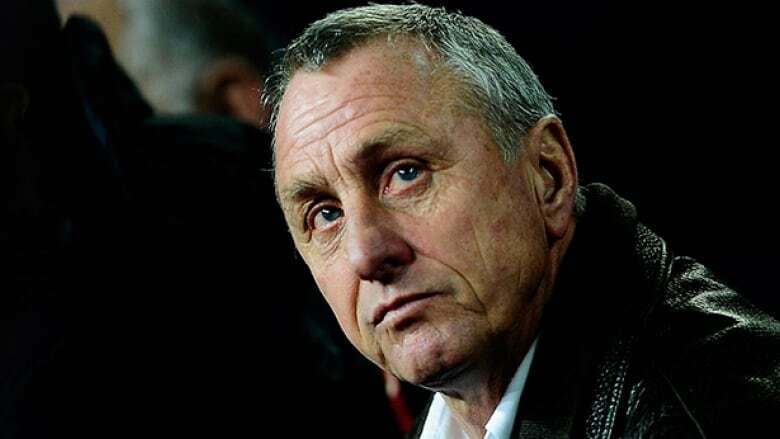 Obsessed by football to the end and ever the positive thinker, Cruyff only last month said his recovery was going well. He said "I have the feeling that I am 2-0 up in the first half. The game is not over yet. Still I know that in the end, I will win." On Thursday, he died. Cruyff won European championships three times with Ajax as a player and once with Barcelona as a coach. He was European player of the year three times and, in 1999, was named Europe's best player of the 20th century. Though a World Cup title eluded him, he was the pivotal figure on the Netherlands' 1974 national team that electrified the sport with its "Total Football" tactics, with players constantly interchanging roles. The tactics influenced the game worldwide. Cruyff smoked cigarettes most of his life and finally quit after undergoing an emergency bypass operation in 1991. After more heart trouble in 1997, he vowed never to coach again, though he remained a vocal football critic and analyst. Cruyff's wiry frame housed surprising athletic talent, unpredictable bursts of speed and agility and precise ball-control that allowed him to trick opponents, ghosting around them with ease. His genius lay in his eyes and mind, in his instinctive feel for how a move would develop. His could pass the ball with uncanny accuracy and wind up time and again at the right spot at the climax of an attack. "Speed and insight are often confused," he said. "When I start running before everybody else, I appear faster." He scored 392 times in 520 games over a 19-year playing career. But his influence reached far beyond creating goals, thanks to his qualities as a leader, thinker and speaker. With a brash Amsterdam accent, he put across his views about soccer and everything surrounding the game with irresistible force. His commentary became oft-quoted classics: "Every disadvantage has its advantage," "You can't win without the ball." As a coach he had 242 victories in 387 matches, with 75 draws and 70 losses. Cruyff was heavily involved in tactics from the start of his career. Along with Rinus Michels, his coach at Ajax and Barcelona, he helped develop Total Football. Under the strategy, players pass the ball frequently to seek advantage, and switch positions seamlessly to adjust to the flow of play. Latin American admirers referred to the orange-clad Dutch national team as "The Clockwork Orange." Cruyff was the personification of a total footballer, playing deep or shallow as the moment required, as deadly from the wings as from his assigned position in the center. He was among the first to see defenders as part of the attack. With Cruyff on the field, Ajax won the European Championship for three consecutive years from 1971-1973 before he moved to FC Barcelona midseason in 1973 and led the middle-of-the-table team to its first national title in a decade. That season was crowned with a 5-0 away win at Barcelona's arch-rival Real Madrid so sweet the Catalans still sometimes refer to Cruyff as "El Salvador," the savior. The transfer fee (922,300 British pounds) paid by Barcelona was a world record and is seen as a milestone in the commercialization of sport. He was also one of the first soccer players to take on corporate sponsorships. British sports writer Dave Miller, who once called Cruyff "Pythagorus in boots" for his ability to calculate the geometry of players in motion, wrote that "few have been able to exact, both physically and mentally, such mesmeric control on a match from one penalty area to another." 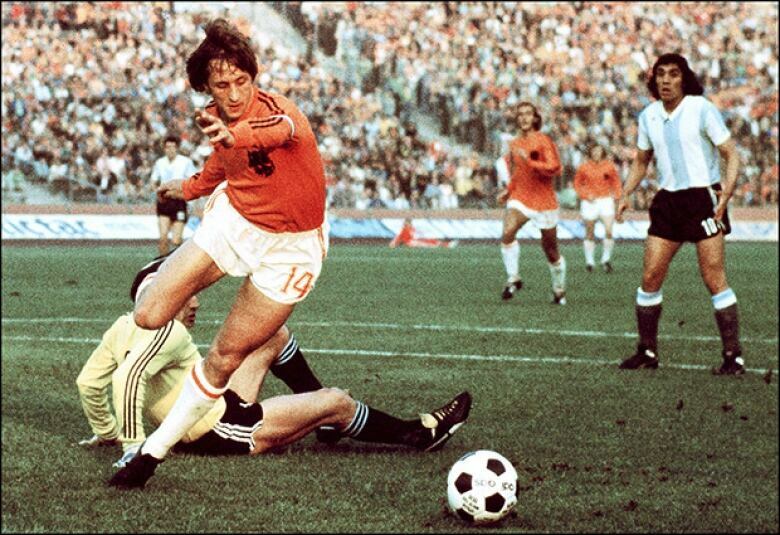 Many fans who watched Cruyff play as children can still replicate some of his moves, including the "Cruyff turn" — a technique he used for passing defenders by faking toward them, then flicking the ball behind his own other leg in the opposite direction and darting after it. Cruyff's oracular pronouncements on the game skirted the line between Zen profundity and nonsense. Criticizing overly defensive play, he once said: "Italians can't beat you, though you can lose to them." Other much quoted lines were: "You can't score if you don't shoot," and "Before I make a mistake, I don't make it." Cruyff launched a tradition of great strikers coming out of the Netherlands: Marco Van Basten in the 1980s, Patrick Kluivert in the 1990s, and Ruud van Nistelrooy in the 2000s. He had a wife Danny, daughters Chantal and Susila, and a son Jordi, who also played soccer professionally.